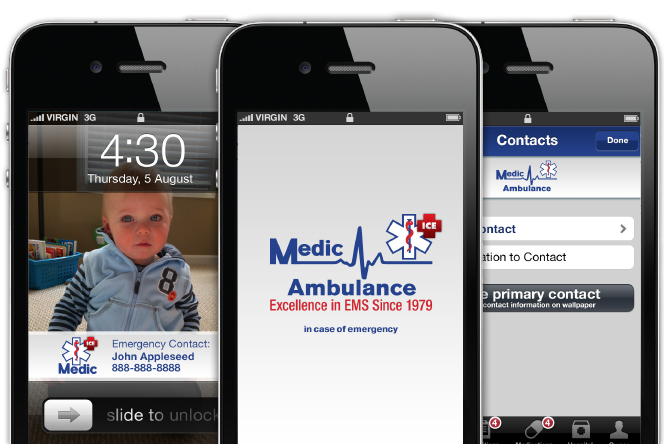 Medic Ambulance Service is the latest in a line of healthcare providers to launch their own version of the ICE App. This app puts your hospital or healthcare service logo on a person’s home screen, along with an in-case-of-emergency phone number, so first responders can see who to contact. Once users download the app and set up the lock screen, your hospital or organization is the first thing the users see when they turn on their phones. C heck out the Medic Ambulance Service version of the app. The app now runs on iOS 7 for iPhone 4 and up. First Responders, such as paramedics, EMTs, firefighters and police look to your cell phone for emergency contact information in order to obtain important medical information. While many people have an ICE contact listed in their contacts, it is often inaccessible because the phone is locked. With the ICE App, your emergency contact info is listed as soon as your phone is accessed on your home screen. The branded app puts your organization’s logo next to a contact phone number on the first screen. Medic Ambulance Service provides quality advanced life support ambulance services in the North San Fransisco Bay area. Thanks for joining the ICE App team, Medic Ambulance! Learn more about branding the ICE App with your healthcare organization’s logo.